Seal of Sustainability™ Awards in Washington D.C. 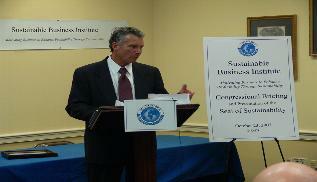 The previous Seal of Sustainability™ Awards were presented to three companies by members of congress See the press release for more information, visit our gallery for pictures of this event. WHAT IS THE SEAL OF SUSTAINABILITY? The Seal of Sustainability™ (“Seal”) is a form of recognition given to businesses and business leaders throughout the world for implementing sustainability practices. 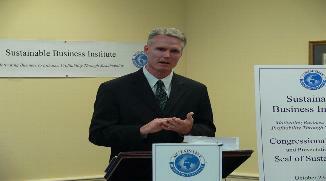 The purpose of the Seal is to honor those businesses which are committed to sustainable business practices. The Seal is also designed for marketing purposes to raise consumer awareness of sustainable products and technologies and to influence their purchasing decisions. WHO CAN APPLY FOR THE SEAL? Businesses of all sizes who are committed to sustainable business practices in economic, environmental and social aspects are invited to apply for the Seal. WHO ARE THE SEAL RECIPIENTS? SBI has awarded the Seal of Sustainability to small, medium and large companies worldwide. Learn more about the Seal recipients. HOW CAN MY COMPANY EARN THE SEAL? The Seal provides the public a way to evaluate purchases based on a business’s economic, social, and environmental impact. By choosing products from companies that have earned SBI’s Seal of Sustainability, consumers know they are contributing to the restoration of natural systems that support all life on this planet. For more information about the Seal, please contact Jessica Fullmer at the Sustainable Business Institute by telephone at (408) 370-5783 or email jhfullmer@sustainablebusiness.org.